Retailers Can Apply Now Through December 13th! Update (December 14th, 2016): Applications for United States and Canadian retailers are now closed. We will be contacting all selected and unselected stores in early February. Retailers located outside of the US and Canada should contact their local distributor for more information on the status of these events. 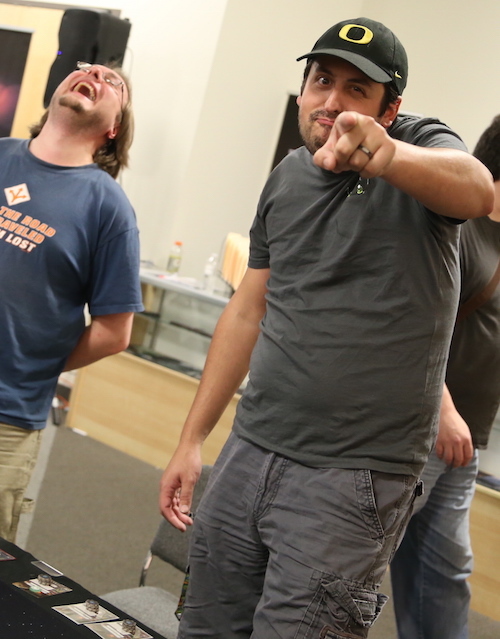 Retailers: Fantasy Flight Games is excited to announce applications for the 2017 Regional Championships (November Track) are now open! United States and Canadian retailers should apply by Tuesday, December 13th 23:59 CST (Central Standard Time) to host one of these prestigious events at your store from May 13th through August 27th, 2017. If you are a retailer located outside of the United States and Canada, please contact your local distributor for more information on how your store could host a Regional Championship. New this season: A select few Regional Championship hosts will be chosen to run a bonus tournament! To be considered, you must indicate that you are willing to organize your Regional Championship tournament with its Swiss rounds on a Saturday, and elimination rounds on Sunday. The bonus tournament will be held alongside the elimination rounds. To find out more about the new Limited Kits, continue reading below. FFG Organized Play has a variety of offerings to promote in-store play of your community's favorite games. 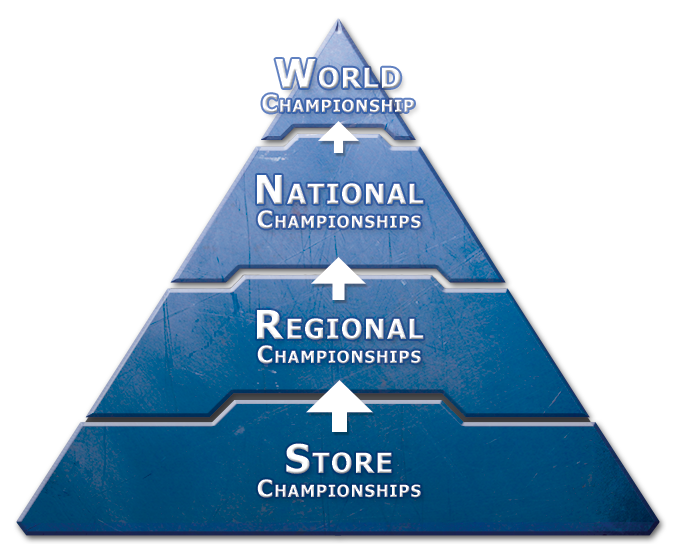 Regional Championships are the second step in our Championship Series, which creates a path of competition for players that starts in your local store and culminates at the FFG World Championships each year! Read on for more information about Regional Championships, how to apply, and what to expect. What Games are Supported on the November Track? 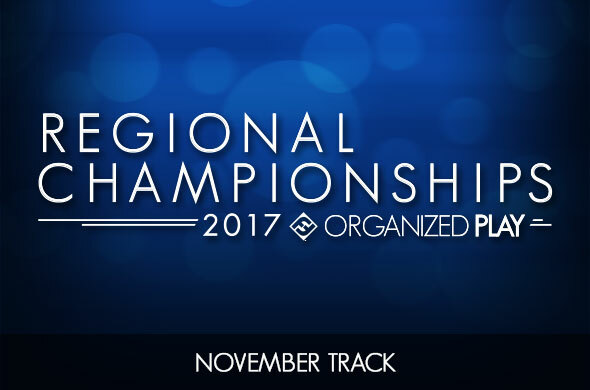 The November Track of our Championship Series supports our games that culminate with the FFG World Championships in November. This track currently contains two of our most competitive and engaging games. Please visit our Organized Play Games page to read more about each game on the November Track which will hold Regional Championships from May 13th through August 27th, 2017. Regional Championships are your chance to host a diverse array of passionate players and create a community that spans beyond your town or city. Players sometimes travel many hours to attend these prestigious tournaments and compete for exclusive prizes, as well as a bye at a National Championship. We encourage stores to add side events, additional kit or product prizes, or other creative ideas to make a player’s Regional Championship experience something to remember. Due to their prestige and competitive focus, Regional Championships need at least one of the leaders to be very knowledgeable in the game's rules and tournament regulations. Additionally, the leaders cannot participate as players; they are expected to focus on promoting a fun and fair environment. For games on the November Track, Regional Championships will be held from May 13th through August 27th, 2017. How Many Regional Championships Will Be Held? Only a small number of Regional Championships are scheduled for each game, creating tournaments with more attendees and more prestige. With that in mind, we select locations to best serve player communities, while also providing geographical reach to as many players as possible. The last—and most important—consideration is finding amazing retailers that will provide a great experience not only to their local community, but also to the surrounding communities that will answer the call of competition. In the United States, we seek to find 24 hosts for each game's Regional Championships. For Canada, we are seeking 7 hosts. These numbers may be adjusted based on the retailer applications we receive, player community growth, product sales concentrations, and travel possibilities. For other international territories, local FFG distributors are offered a maximum number of Regional Championship Kits based primarily on that territory's product sales for a game and historical OP participation. Each local distributor will make their own decisions about retailers offered the opportunity to host a Regional Championship, so contact your local distributor for more details. What Comes in a Regional Championship Kit? Each Regional Championship Kit contains everything needed to host an incredible tournament for your players. Each kit also contains an extra copy of each Regional Championship prize, except the trophy and bye card, for organizers to keep or distribute at their discretion. The exact contents of each Regional Championship Kit will be previewed closer to the start of the season for these events. NEW: What About the "Bonus Tournament" Being Offered? Much to our enjoyment, many of our games have experienced a noticeable surge in competitive tournament attendance over the past year. In evaluating how we guide this growth while also preparing for the possible strain on the established offerings, we identified three key areas that we want to focus on. First, we wanted to find a great way to recognize those retailers that will go the extra mile to host an extraordinary Regional Championship. We also want to ensure that the wonderful player communities that turn out in droves can be assured that they will receive that event's extended art card. Second, we have been investigating various possibilities to promote some alternate ways that many players enjoy playing their favorite game at the local level. Lastly, many retailers that host some of the largest Regional Championships each year have started expressing difficulty in completing the many rounds of a large competitive event in a single day. These considerations led to a solution that addresses all three: Limited Kits. These new kits will supplement a limited number of Regional Championships at select retailers around the world, by supporting an additional event that will utilize an alternate way of playing the game. However, to be eligible for consideration for the bonus tournament, the retailer must indicate their willingness to organize a Regional Championship tournament with its Swiss rounds on a Saturday, and elimination rounds the following day, on Sunday. The bonus tournament will be held alongside the elimination rounds. In this way, each day of competition will be more manageable for events with a large turnout. To complement that benefit, the selected Regional Championships will encourage more players to travel to them, as they offer two full days of competition, including an opportunity to play an alternate format or variant for even more prizes on the second day. 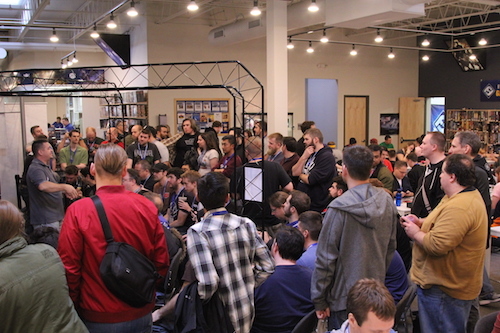 Additionally, the retailers chosen to host the bonus tournaments will be able to request additional copies of the Top 64 Regional Championship prize card if they anticipate higher attendance (subject to distributor and FFG approval). Players should start thinking about road trips to one of these special locations now! NEW: What Is in the Limited Kit? The Limited Kits contain new materials to enhance the environment of a retailer's events, with a large vinyl banner and game-specific table numbers. They also contain five of a core prize, one of an elite prize, and an art trophy. There is also a Limited Prize Kit, used as a supplement to the Limited Kit. They simply contain an additional four copies of the core prize, and an additional copy of the elite prize. By adding additional Limited Prize Kits to an event using a Limited Kit, the amount of prizes can be tailored more closely to the expected attendance. Importantly, a Limited Prize Kit cannot be used without the Limited Kit. NEW: What Alternate Format or Variant Will the "Bonus Tournament" Use? The bonus tournament will exclusively use a specific alternate format or variant for the game. The structure of a bonus tournament has only Swiss rounds, and will run in tandem with the elimination rounds for the Regional Championship. For example, the first round of the bonus tournament might be scheduled to start at the same time as the elimination round of Top 8 players. Players competing in the elimination rounds for the Regional Championship will be able to jump into the bonus tournament's next round after they are eliminated or finish, with byes or appropriate tournament points for the rounds that they missed. The bonus tournament's last Swiss round will start immediately after the final elimination round of the Regional Championship. NEW: What if My Community Does Not Have Access to the Limited Kits? Due to the limited number of events we want to support with these kits, this is a likely possibility for many communities. However, additional Limited Kits and Limited Prize Kits will be used at some other events around the world through a new program, starting in the months following the Regional Championship season. Stay tuned for upcoming Organized Play announcements about this opportunity, and sign up for our Retailer Newsletter and Community Newsletters to never miss another update! However, if your store is chosen to host a Regional Championship without the Limited Kit, you can still elect to organize your Regional Championship over two days, Saturday and Sunday. You could even hold a side event on Sunday, using the same structure as the bonus tournament, and distributing other prizes, like those from Tournament Kits. The exclusive prize items and alternate art cards included in these kits are only available at 2017 Regional Championships, so be sure to talk with your local retailer about applying to host a Regional Championship. United States retailers can submit an application now, and Canadian retailers can submit their application, for consideration to host enthusiastic players in your area during the May-August Regional Championship season, for November Track games. International retailers should contact their local distributor for more information. Don’t miss out! These applications close on Tuesday, December 13th at 23:59 CST (Central Standard Time).